This, one of the most unusual fusto fantasies also possesses a Herculean amount of ingenuity. Besides containing relatively little of the action typical of the genre, Mario Bava instead paints his phantasmagorical peplum in bright, blood red brush strokes like a macabre painting come to life. It being his first film in color, the revered director of dark fables turns in what has to be the most visually striking and effervescent of all the 200 plus peplum adventures. 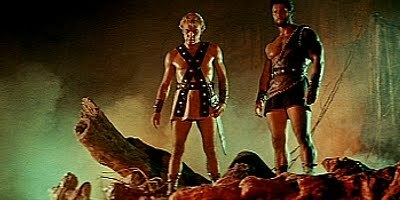 Britain's Reg Park plays Hercules who journeys to Hades to retrieve a magical stone that will save the king's daughter from a mysterious and deadly ailment, all part of an insidious plot orchestrated by the vampiric Lyco. Christopher Lee plays the main villain and George Ardisson essays a good guy for a change as Theseus, Hercules's sidekick. Like other Herc pictures, pieces of the actual mythology are utilized in the screenplay and Bava certainly has a grand time with the numerously ingenious, creatively accomplished composite shots and set design. Its success spawned several more 'Muscle & Monster' tales. Adding weight to the spooky, multi colored aura, there's zombies, witches and a rock monster. A major technicolor triumph for the one and only Mario Bava.